liked and sought after in the workplace and in your personal life. Here is how you can be noticeably different. We will explore and explain what went wrong in our society, then give you a simple three step process to remedy it in your own life, so that you will stand out as an honorable person with good ethical judgment. In other words, this remedy will help make you better at being the kind of person others need and seek out as employees, business partners, friends and spouses. Equally important is how to think about these rules — how to use them as tools to handle situations we run into each day at work and in most other parts of our lives. But the child's peers have hours per day they can spend influencing a child's beliefs and behaviors. 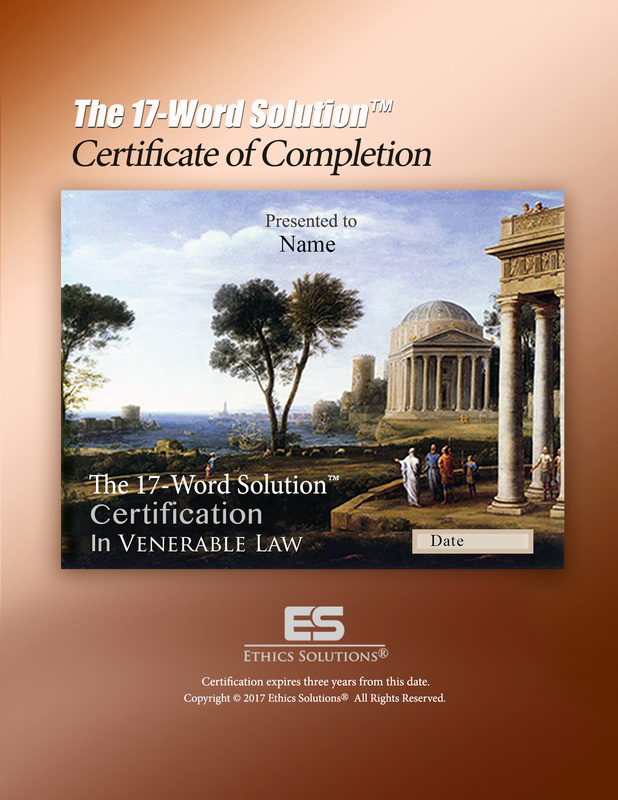 Ethics Solutions has condensed the six years of ethics instruction into a single small, easy-reading booklet called The 17-Word Solution.™ This handbook is the first step toward improving your knowledge of ethics. It takes only about two hours to read. The first assessment is before you study the handbook, to measure your present knowledge of ethics. The second measures your knowledge after you have studied the handbook. The third, two or three months later, shows how well you have retained the understanding, in case you need to go back to the handbook to refresh your knowledge. And please think about this: if you do not learn about the "eternal and immutable law" through your own efforts, how will you learn it? 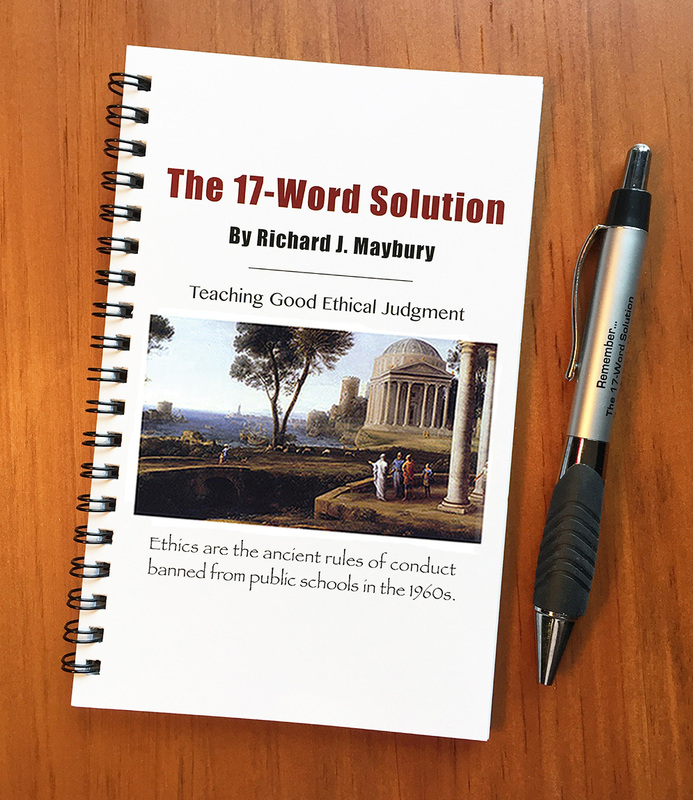 If the need for teaching ethics as a regular part of education is so obvious, why aren't schools already doing it? We suspect because schools are afraid teaching ethics automatically means teaching religion; they will get in trouble with government regulators. Another is to show a person the bad things likely to happen when a rule is broken, and the good ones likely when it is obeyed. The 17-Word Solution™ takes this pragmatic approach. Here is a major benefit. . .
…you will find in your new skill with ethics. In a disagreement, you will be able to see instantly whether you are right or wrong. And, if you are right, you will be able to argue your side of the case much more persuasively. You will also have the peace of mind that comes from knowing you are standing on firm ethical ground when deciding to argue your side, or when you make any other decision. …you take the 40-question multiple choice assessment electronically. The assessment is instantly scored, and the results are reported to you. If you have demonstrated proficiency, a Certificate of Completion is immediately issued to you. This handsome, impressive, full-color certificate gives you a sense of pride and confidence so that, in the face of troublesome peer pressure, you will stand your ground and do the right thing. If you did not achieve proficiency, you can review the handbook and take the assessment again. It may only take one unethical act to derail a person in their private and public life. But one who has a reputation for always behaving ethically is golden.